We have been following Gary since May 2017 where he was one of the first gulls to be tagged here at Tag-n-Track. Since then we have had lots of fun with this guy and he appears in all our talks and workshops. 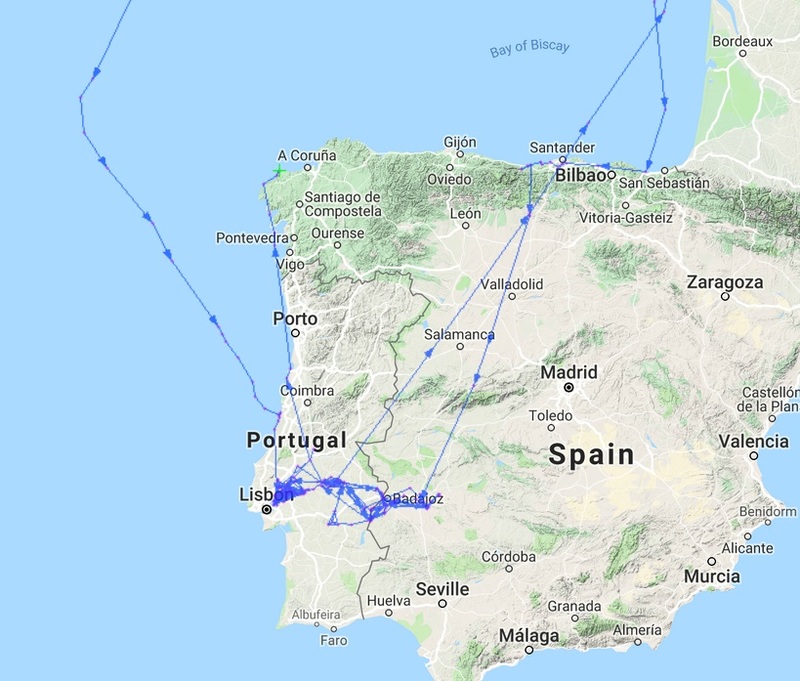 Gary has been overwintering in Portugal again before showing signs that he was getting ready to come home by heading to some of his favourite places in Spain before heading back into Portugal. On Tuesday (19th) he decided it was time to leave Albuferia where he has been for the last week and head towards the coast. He left at 1440 and after flying for 6 hours he reached the coast in the Aveiro region. He continued flying until the early hours of Wednesday morning where he decided to rest up at São Jacinto. By mid-morning he was off up the coast again and flew into Spain in the early afternoon. He has continued heading north hugging the coast passing Louro at 1734 and Camariñas at 2033. He is likely to have had a wee rest overnight before being picked up again at 0831 on Thursday morning on the north eastern tip of Spain. Gary’s migration really excites us as he is taken a different route to the one we recorded on his outbound journey at the start of the year and his 2017 migration. We are looking forward to seeing him back at Greenock Police Station.